Get the facts about Alzheimer’s Disease, including the symptoms and stages. Alzheimer's Disease Facts about Alzheimer’s Disease, including the symptoms and stages. Epilepsy Facts about epilepsy, including different types, symptoms and causes. Parkinson’s Disease Get the facts about Parkinson’s disease, including symptoms. Dr. Robert L Cach, MD is a Doctor primarily located in Idaho Falls, ID. He has 28 years of experience. His specialties include Neurological Surgery. He speaks English. Dr. Cach has received 1 award. The overall average patient rating of Dr. Robert L Cach is Great. Dr. Robert L Cach has been rated by 16 patients. From those 16 patients 12 of those left a comment along with their rating. The overall rating for Dr. Robert L Cach is 4.4 of 5.0 stars. A neurological surgeon is a physician who surgically treats disorders of the nervous system, which is comprised of the brain, spinal cord and nerves. In addition to treating trauma of the head and spine, these doctors also treat disorders like epilepsy, aneurysms, hydrocephalus, Parkinson's disease, multiple sclerosis, stroke, spinal disc herniation, and spinal disease. Neurological surgeons can perform surgical procedures on the brain, such as stereotactic surgery, microsurgery, endoscopic surgery, stereotactic radiosurgery, and endovascular image guided methods. Excellent work, fixed my L4 issue w/ only 1 month recovery. I never really expected much from bedside visits, but he did see me right after recovery and the next day. I have now had two spinal fusions, both by Dr. Cach. Personally, I think he's brilliant. I did excellent and felt a million times improved after the first surgery. This issue crept up on me somewhat rapidly, although he had mentioned during the first fusion that a second may be needed down the road. I am 10 days post op and feel so my better already, although weak and low energy which is to be expected. Thanks doc. Dr. Cash can save your life! I wouldn't be alive today if it wasn't for Dr. Cash! Dr cach operated on me for a neck problem.. He was very personable and kind. He fixed my neck and allowed me to return to work after months of being in pain. We live out of state and therefore need to maximize our time spent on office visits. Dr Cach and his staff are always willing to work with us setting up xrays and tests closer to home making the process much more efficient. The professionalism, skill, and courtesy of the staff is unparalelled and truly makes the entire process as pleasant as possible. Dr Cach is an excellent surgeon and I would recommend him at any time. 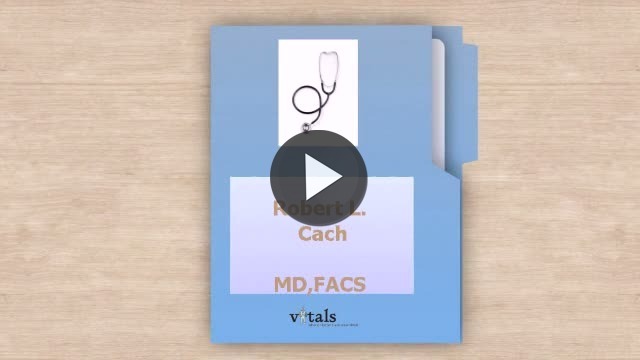 Take a minute to learn about Dr. Robert L Cach, MD - Neurological Surgery in Idaho Falls, ID, in this video. Dr. Robert L Cach is similar to the following 4 Doctors near Idaho Falls, ID. Have you had a recent visit with Dr. Robert L Cach? Select a star to let us know how it was.